The Charlie Hebdo massacre on Wednesday and the shooting of a police woman in Paris on Thursday are linked, a police source reportedly told AFP. It is alleged that all the attackers were members of the same terror cell. 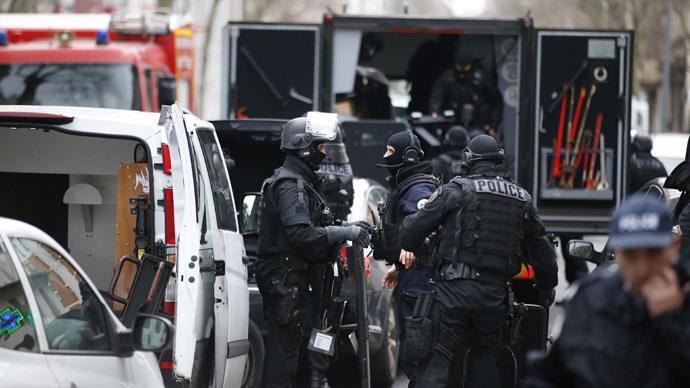 On Thursday, the French Interior Ministry said that the man who killed the policewoman, 26, near La porte de Chatillon, Montrouge commune, south of Paris, didn’t have any ties with the Kouachi brothers according to their data. However, on Friday police sources told AFP that it turned out that the shooter knew the brothers. Le Point magazine said the Montrouge shooter and Charlie Hebdo attackers were members of the Buttes-Chaumont cell, which is linked to Al-Qaeda. The Kouachi brothers are suspected of being behind the attack on Charlie Hebdo magazine HQ, which killed 12 people including the magazine's top editor, prominent cartoonists, and two policemen. Charlie Hebdo has been a source of controversy in the past and has received numerous threats for satirizing the Prophet Mohammed and other prominent Muslim figures. France has launched a large-scale manhunt for the suspected shooters. On Friday, police reportedly closed in on the suspects, who are said to have taken one or several hostages near the Dammartin-en-Goele commune in northeastern France, 50 kilometers from Paris.